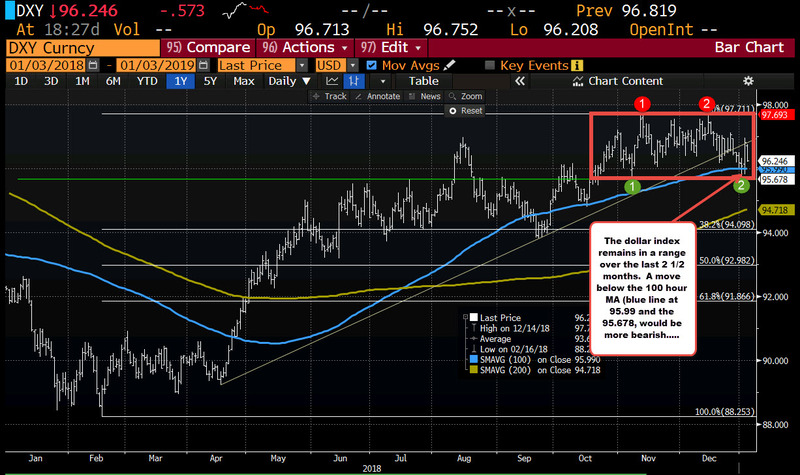 In 2018, the dollar index moved higher with the price mostly trading above it's 100 day MA since the break higher in April (see blue line in the chart below). There was a 6 day period in September when the price closed below the MA. That was it. However, the last 2 1/2 months has seen the price trade in a sideways range between 95.678 and 97.693 with lots of up and down days. The market is non-trending. That has allowed the 100 day MA to catch up to the price. Technical traders like that as risk and the trading bias can be defined and limited. To start the new year, the price tried to crack the 100 hour MA and the lower floor but stalled. Today, the price opened higher but is currently trading near the session lows and is getting closer to the lower extreme. The high today also stalled ahead of the broken trend line. On the surface, the sellers are trying to push lower. However, it is important to let the price action confirm the move down. That will only come when the market breaks out of the range with momentum. Nevertheless, the table has been set and at some point, the market will decide which way it wants to run. Speaking of 2018, below is a chart of 2018 with some of the events that moved the market. It is kinda crowded but informative at the same time. Print it out and put it in your trading log for the year.